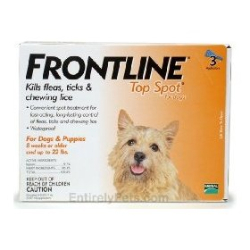 Frontline Top Spot is a monthly topical flea and tick medication. It's effective against all life stages of ticks, including the brown dog tick, the American dog tick, the lone star tick, and the deer tick (the major carrier of Lyme disease). Kills all existing fleas on your pet within 24 hours Comes in an easy-to-apply liquid Remains waterproof for 30 days Each application provides a full month of protection. For dogs Up to 22 lbs. 6 dose supply.